The Search for Accountability in securing justice. The above is a piece that was written after Levi saw the Holocaust repeating itself in Cambodia. Accountability, as a word, doesnt seem to be in existence when it comes to crimes against humanity. More than half of the world today is victimised by international crimes while the international community sits in the UN and passes resolutions that seem to have no effect. The other day I read on DAILY DARFUR that the US non intervention in the matter is because of Kharatoum’s support and giving information to the US about Osama. Powerful governments dont seem to value life of the people in other parts of the world (ps: the death toll in darfur crosses 300,000). Gone are the days when Woodrow Wilson gave his fourteen points and pledged for the safety of the international order. While international crimes are occurring there seems to be lack of action on the part of the international community to prevent them. The answer then lies in making the Governments responsible for the protection of the international order. The International Criminal Court (ICC) then is one step in furtherance of this effort. The first cases have been taken up by the Prosector against the Lords Resistance Army and the world is waiting to see what happens next. Can the Court stand up to the very principles it was meant to protect? However, its not just governments that are playing a role in ensuring international justice. NGOs and activists have been very supportive and played an important part. More info can be found at the NGO Coalition Site. In India for instance, ICC – India is conducting awareness workshops about the International Criminal Court and mass crimes situations in India. Similar initiatives are seen in other countries. There can be no justice without accountability. Accountability happens when the governments feel more responsible towards the lives of people. A lot of doubt has arisen on the nature of the right to food. While the petition of PUCL is still being decided by the Court, interim orders have been passed to secure the right to food for children and other people. But then, in what sense are we construing the nature of this right? A reading of Paschim Bengal Kisan Samiti and Francis Coralie tells us that the right to food may be interpreted in Article 21 of the Indian Constitution. However, no case has formally sought to do so. I would like to look at the nature of this right in light of starvation deaths. 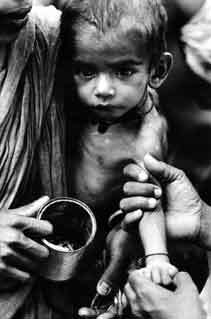 There are around 50 million people dying of starvation in our country. This is at a time we call the ‘economic boom’ and see a rise in agriculture exports. Food surplus reached around 12 million tonnes in 2002. The above data is relevant if we understand food in terms of the rights enshrined in part III and part IV of the Constitution. While part III enshrines the civil and political rights, part IV or the directive principles talk about the economic and social rights. Part IV rights are non- justiciable and cannot be enforced in a Court of law. The Constitution assembly debates show that part IV rights are placed such because they can only be enforced if the state has the requisite resources to provide for them. Since at that time, the State did not seem to have the resources, they were termed as the ‘fundamental principles of governance’ and must be achieved as soon as possible. BR Ambedkar and Dakshayeni Nivedkar stated that once the state has resources, such rights must be provided for. It then becomes an obligation for the State to do so. In terms of the right to food, Article 47 in part IV gives us an idea of the right to food and the responsibility of the state in raising the level of nutrition in the Country. This right then still is a non justiciable right and cannot be enforced per se. Now here lies the argument, if economic and social rights are to be enforced depending on the State’s availability of resources, would the very fact that people are dying despite a food surplus be deemed a denial of a right and the violation of an obligation on the part of the State to provide? If we have people starving to death and Food Corporation of India godowns filled with food 50 kms away, would this be a violation of the obligation to provide, respect and protect? This is something we need to ponder about. Why is it that despite the resources at hand the State does not provide for the welfare of the people? This does not apply to merely food but also other areas like education and employment. Somewhere down the line we see the whole idea of a welfare state boiling down to a mere idea that exists only in theory and not in practice. Below is a motion of the European Parliament. It is revolutionary in the sense that it is obliging India to do something that its not done in the past many years. This resolution also comes forth in light of the Indian review of the Convention on the Elimination of Racial Discrimination (CERD) which takes place tomorrow. The .Pdf version of the Document may be downloaded here. 14. Instructs its President to forward this resolution to the Council, the Commission, the governments of the Member States, the President, the Government and Parliament of India, the UN Secretary-General, and the heads of the UN Sub-Commission on the Promotion and Protection of Human Rights, the International Labour Organization, the UNICEF, the World Bank and the International Monetary Fund. (5) 2001 Census of India.